Now that Scarlett is eating pretty much whatever we eat, our eating habits have changed. They have improved, actually. I can tell you that I have a major sweet tooth. I love chocolate, sweets and pastries. Before Ty came into my life, my meals consisted of a lot of frozen meals, sandwiches and cereal. Ty loves to cook. He has broadened my taste in food. But it was really Scarlett that got us to take a serious look at what we were eating. Since then, I've always tried to feed her organic food. Not because it's the new trend, as it seems. It was because I grew up eating out of a garden. Fresh and healthy with no pesticides. We have started buying organic as much as possible. Doing this, literally makes our grocery bill go up a $100 a trip. This is where the farmer's market comes in. What an amazing place to buy fresh, local & inexpensive food. We took a trip there this weekend with Ty's sister, who came to stay with us this weekend. Scarlett: Printed Dress: H&M, Jean Vest: Old Navy, Sandals: TJ Maxx, Stuffed Animal: A mini sock monkey, which she has named, 'Number 9'. Babies are so sweet! Nice when they eat more foods. The first picture is wonderful! Love your shades! 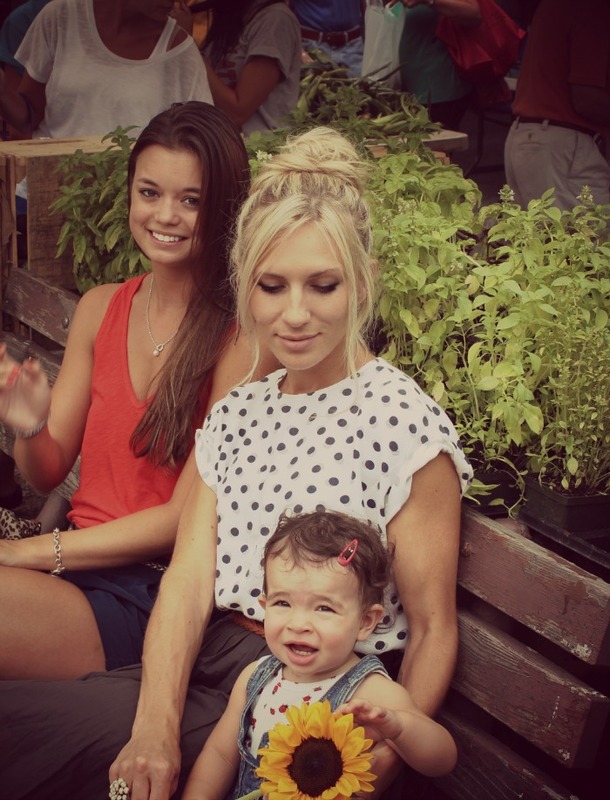 Absolutely love the farmers market!!!!! 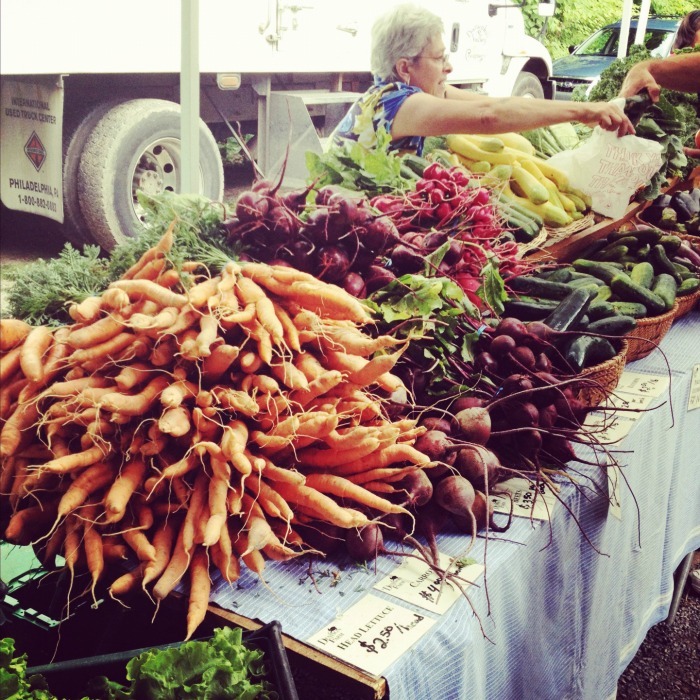 Your farmers market looks amazing! I wish ours had that much variety. I love the picture of you and Scarlett walking... so sweet! Your photos are beautiful, how are you liking your new camera? What a fun day! Your outfit is too cute! And Ty's sister is beautiful! 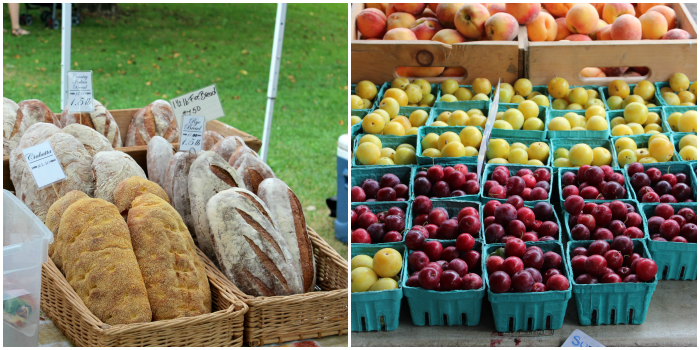 We have a farmer's market right down the street and I hope to get to it soon! I love a trip to the Farmer's Market and I love your outfit. 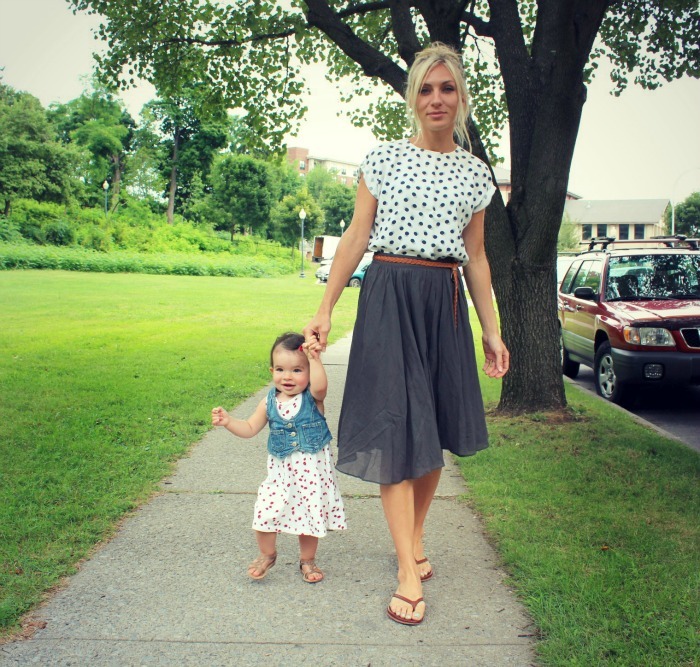 Polka dots are one of my favorite things to wear, they're so fun! I saw this on My Girlish Whims and your photo was just gorgeous. New follower... after all, how could I get through this post and NOT follow you?! Love all your pictures! Love your polka dot shirt. Saw you over at WIWW. Love your top with the skirt and belt. I just took my two little guys to the Farmer's Market last week for the first time and they loved it. Its so good for kids! 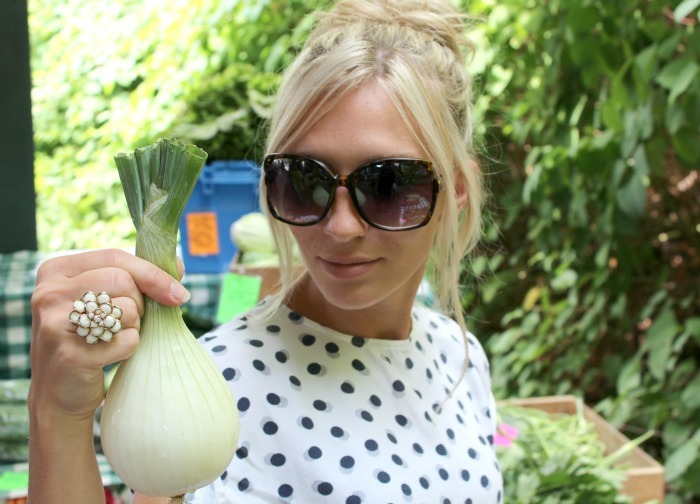 Perfect outfit for the farmers market! Love that skirt! I'm hoping my diet changes for the better as my son gets older. Love these photos. Such a perfect outfit for a day at the farmer's market. Popping over from the Pleated Poppy. I love farmer's markets! 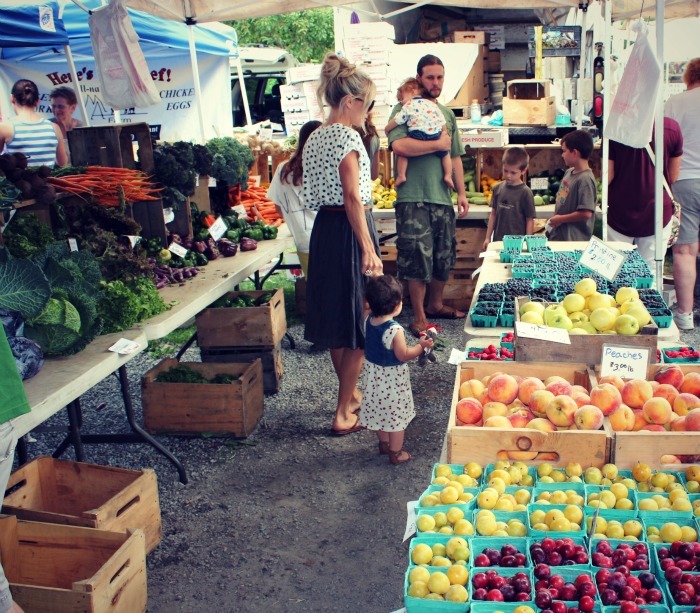 My sister lives in orgeon where there are markets nearly daily - my nephew loves his fresh organic veggies! looks like so much fun! we have one in our city, but it's pretty small. and as always, you look just darling! thanks for linking up to tip-toe thru tuesday! blessings! Absolutely love your outfit Lauren..and your shades..your daughters outfit is totally adorbs too! send me an e-mail let me know here you are in NY,,we could be close by! Polka dots and ladybugs...a most perfect combo! Thanks for being a part of Monday Mingle! The cutest combo! You and your little girl are so cute together, and I love your polka dots. I wish my little girl would eat what we eat... such a struggle. I definitely try to buy organic as much as possible, too - it makes our grocery bill kind of ridiculous, but I feel so much better about what I eat that way. 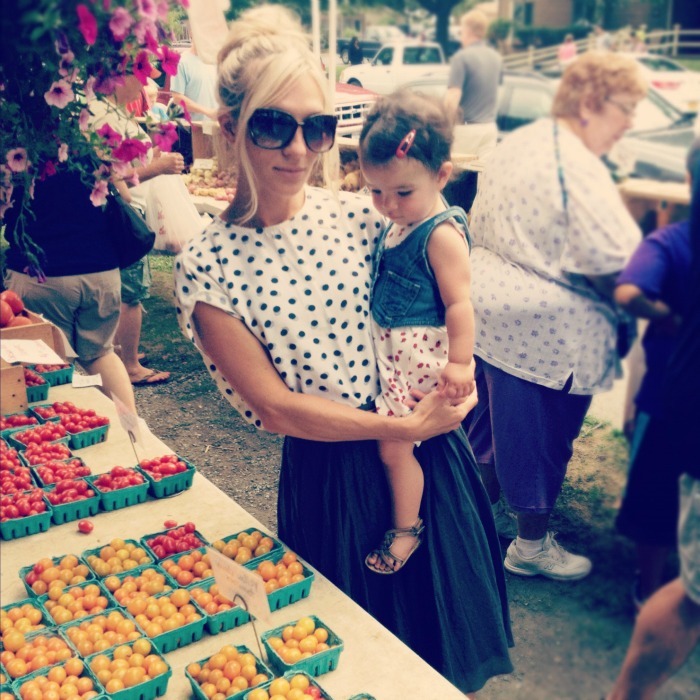 You look waaaay cuter than I do when I go to the farmer's market! I love your polka dot top. Gorgeous shots. Love the polka dots and the little one's denim vest. Too cute! You both look lovely. Like your ring - looks like Stella & Dot? 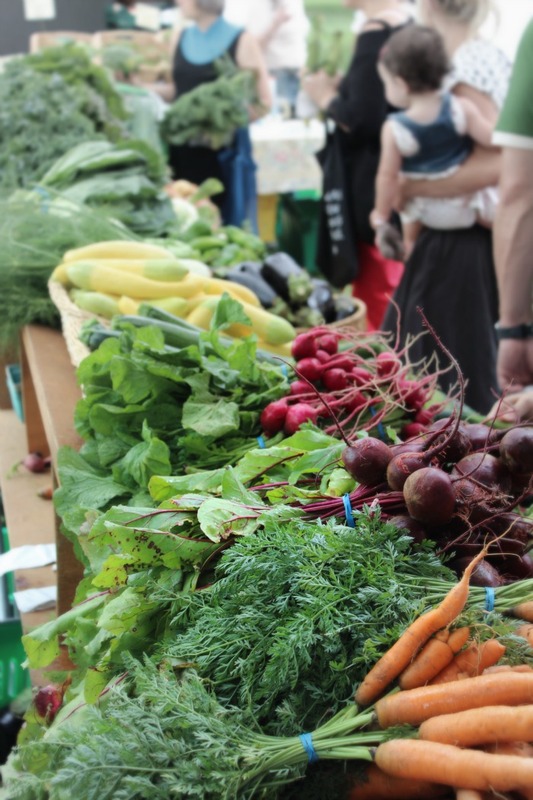 That farmers market looks lovely, such fresh bright produce! This outfit is TOO cute for the famer's market! And Scarlet? TOO STINKING CUTE! Found you on Monday Mingle. great looks for both of you cuties!